OVER $100K+ INVESTED - TWIN TURBO CARRERA CABRIO! This one of kind custom designed 1997 Porsche 911 (993) Carrera Cabriolet Twin Turbo is finished in Black with Savanna Beige Leather interior. This Porsche has over $46K in service and modification receipts! This Porsche is capable of producing over 600+ horsepower! Dynode at 488 RWHP and Runs on 91 Octane! Performance upgrades include: R&R adjustable Performance Suspension with JRZ Shocks, 20 inch HRE Forged Staggered HRE Wheels wrapped in Pirelli P-Zero Rosso Tires, Roll Cage, Promotive Stage 2 Kit, Twin Garret GTR30 Turbochargers, Euro RSR Clutch kit, 993 Bypass Tubes, R&R Oil cooler, Promotive intercooler, 993 Twin Turbo Headers, Porsche 993 Turbo body and Aero body package and so much more! This Porsche runs and drives better than any 993 Porsche on market! The condition and service on this car is close to perfect! This is one time opportunity to own a piece of Porsche history with todays demand for power and performance. This is a Porsche that what men dream of at night wishing they had this car in their garage! Priced to sell fast! Serious inquiries only! ****** All of our high-end vehicles are processed through a Multi-Point Inspection to ensure that the vehicle is of the Highest Quality & Drivability, please inquire about our vehicles and ask a representative for more information. 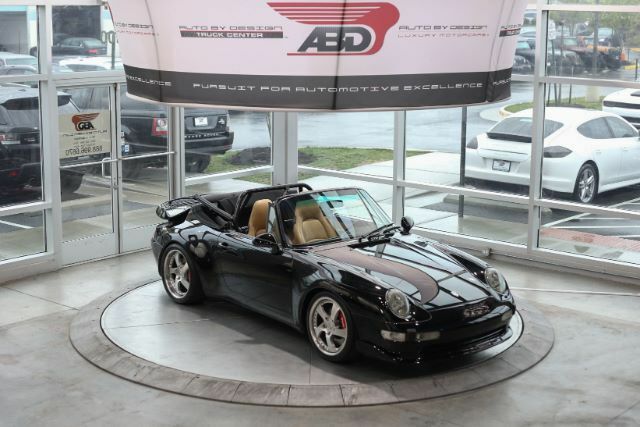 ****** This Porsche 993 Twin Turbo Cabrio Comes with a Clean Carfax Report. We offer Nationwide Shipping right to our door step and we offer Worldwide Shipping logistics as well as Financing is also available for our vehicles with rates as low as 3.79%** for well qualified buyers**. All of our new and used car loan services are hassle-free and there is no obligation for you to apply for a car loan today. We can help you finance your next car, truck, van, or sport utility today with our easy auto loan application.